Christie is pleased to announce that Major Cineplex, the largest cinema operator in Thailand, has chosen Christie’s unique RGB laser projection system for its flagship auditorium, Paragon Cineplex, to deliver the ultimate 3D viewing experience for movie-goers. Located on the fifth floor of the famous Siam Paragon shopping mall in the heart of the city, Paragon Cineplex comprises 16 screens and 5,000 seats, and is well-known as Thailand’s largest cineplex. The projection system will be fitted in Siam Pavalai theater, Thailand’s single, grandest theater equipped with 23-meter screen and 1,096-seat capacity, making it an ideal venue for the deployment of the Christie RGB laser projection system. The system is comprised of a Christie CP42LH 3DLP 4K RGB laser projector featuring enhanced wavelength diversification (EWD), connected via fiber optic to a laser rack housing eight laser modules that generate white light from multiple combinations of RGB primary color wavelengths to offer a spectacular 3D viewing experience on silver screens. The single system is capable of generating 40,000 lumens – much brighter than what current, lamp-based digital projectors can deliver. With this installation, Major Cineplex will be the first exhibitor in Thailand to deploy Christie’s pinnacle RGB laser projection system. The CP42LH produces a color gamut that exceeds the DCI P3 color spec and replicates the Rec. 2020 space, making it the most advanced RGB laser cinema projection system available on the market. It consists of rack-mounted laser modules where each module can produce up to 5,000 lumens of white light. Because of the scalability of this platform, up to 12 laser modules can be easily added, removed, activated or disabled depending on brightness requirements. This provides up to 60,000 lumens per rack. Each laser module is also independently cooled, providing built-in fault protection, improved efficiency and reliability. Christie’s RGB laser projection system is the preferred choice for a premium 3D cinema experience for an increasing number of leading cinema chains around the world. 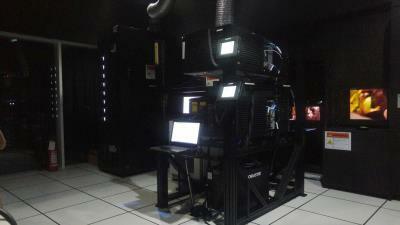 In Asia, theaters equipped with Christie laser projection technology include Tongzhou Wanda Cinema in Beijing; the iconic Shanghai Film Art Center; Suning Cinema halls in Shanghai, Zhenjiang, Anshan and Baotou; Oscar International Cinema in Xi’an and Xiamen, SM Seaside City in Cebu, the Philippines; CGV SphereX Youngdeungpo in Seoul, South Korea; CGV Centum City in Busan, South Korea; CGV Vietnam in Ho Chi Minh City, and HOYTS Chadstone in Melbourne, Australia.